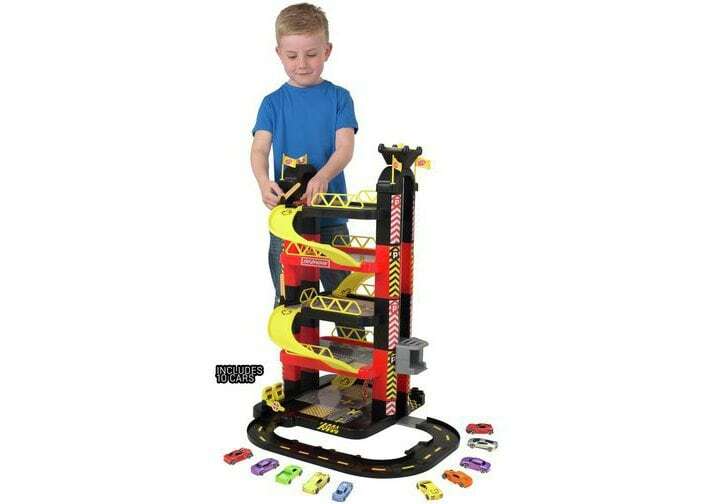 This brilliant Chad Valley Deluxe 5 Level Garage & Cars Set is sure to be a big hit with your little one, it's jam packed with the things kids adore. Stimulating creative vehicle based roleplay games, your most cherished can make use of all the fantastic accessories including a road to zip the die-cast cars around (10 included! ), barriers to prevent cars navigating down areas they're not authorised to, petrol pumps to refill the tank ready for another adventure, ramp to speed over, a car wash so the cars always look their glorious best, a working lift to take them to a different level of the garage, parking bays, track adaptor and even a helipad! Watch the eyes widen as they discover this bumper set of goodies. A nice added bonus is that the track pieces are compatible with other Chad Valley track sets, so your little one can customise for a truly unique experience (Size H70, W65.5, D67cm). Get money off with April 2019 free Argos voucher codes, see if there's a discount code for the Chad Valley Deluxe 5 Level Garage & Cars Set product.